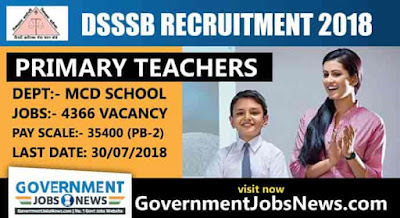 Delhi Subordinate Services Selection Board (DSSSB) has published a notification for the recruitment of 4366 Primary Teachers Government Jobs in different subjects. 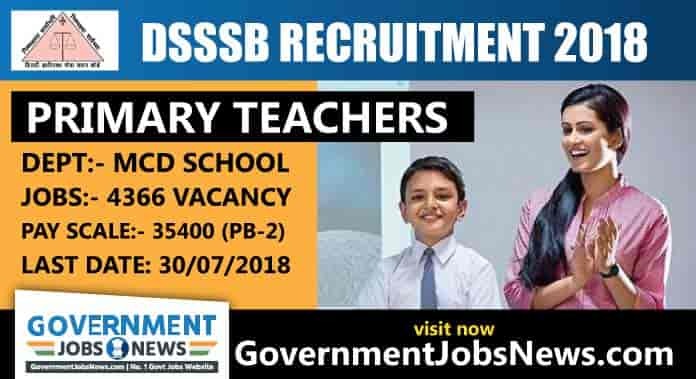 DSSSB Recruitment 2018 for primary teacher all details given in this article. Eligible Indian Citizens may apply online from 02/07/2018 to 30/07/2018 up to 23:59 hrs. Other details like age limit, educational qualification, selection process, fee & how to apply are given below. Students should be passed Senior Secondary (10+2) or Intermediate or its equivalent from a recognized board/institution. Must have Two years Diploma / Certificate Course / in Elementary Teacher Education Course/ Junior Basic Training or equivalent or bachelor of elementary education from a recognized institution. Have Hindi as a subject at Secondary level. Have English as a subject at secondary or senior secondary level. SYLLABUS: for One Tier Schemes. Age Relaxable to SC/ST/OBC/Departmental Candidates/ExSM/PH in accordance with the instructions/orders issued by Govt. of India from time to time.